Dental Videos For Your Website! Turn your website into an educational resource and engage patients on a whole new level! What's the best way to make sure a patient follows through on treatment recommendations? Give them clear, credible information on the vital benefits of the dental treatments you provide. That's exactly what Dear Doctor videos are designed to do—and they do it better than any other patient-education product available today. No other videos have Dear Doctor's engaging mix of friendly on-screen narrators, state-of-the-art animation, and easy-to-understand language. It's a compelling package that can't help but give patients the confidence to move forward and do what's best for a healthy, beautiful smile. Dear Doctor's high-definition videos play beautifully on all mobile devices, tablets and desktops. Best of all, your video library subscription includes all updates and new videos that are added to Dear Doctor's ever-expanding library. High definition videos with anatomically correct illustrations and animations enhance the viewing experience and bring the information to life. Dear Doctor partners with some of the nation's most respected professional dental organizations to ensure the highest standards of accuracy. Professional, friendly on-screen narrators present dental topics and procedures in easy-to-understand language. 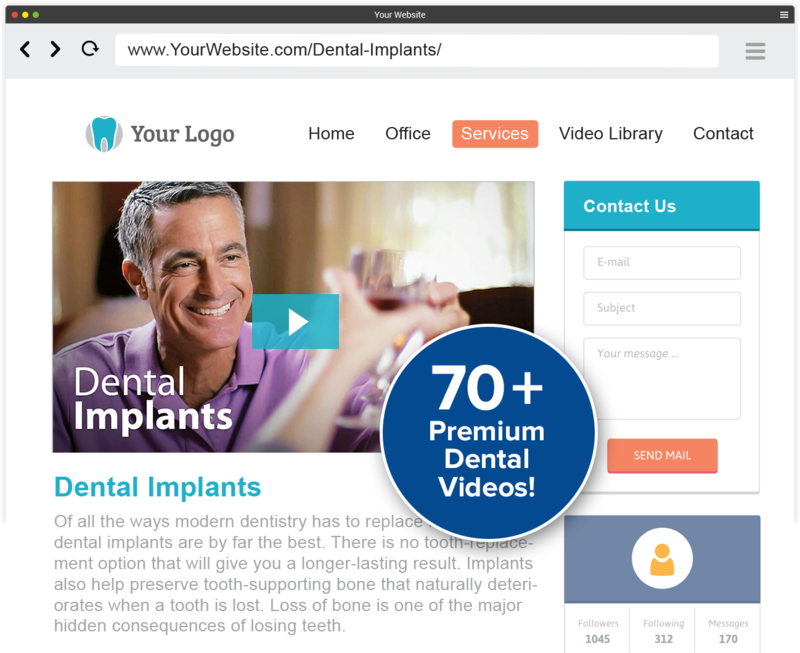 Your website visitors have unlimited access to over 70 videos on a wide variety of dental topics. The entire library can be accessed on any device, including smartphones. Once you sign up, we'll add the videos to your website for you in no time or work with your website company to get them up and running. We're creating new video content all the time, and Dear Doctor subscribers get access to new content as soon as it's released. Dear Doctor's technical staff will keep your videos running smoothly so your staff can focus on other priorities. Complete the form below to get started. If you have any questions, you can live chat or call a Dear Doctor representative at 866-821-5458. Want to speak with a Dear Doctor representative? Give us a call and we'd be happy to answer any questions!